In 1942, Pittsburgh artist J. Howard Miller was hired by the Westinghouse Company's War Production Coordinating Committee to create a series of posters for the war effort. One of these posters became the famous "We Can Do It!" 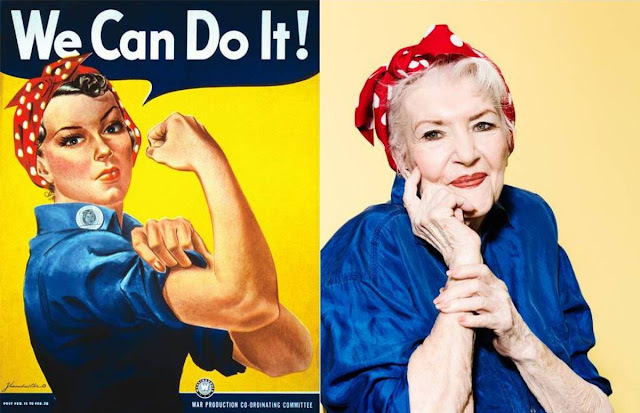 image—an image that in later years would also be called "Rosie the Riveter", though it was never given this title during the war. Miller is thought to have based his "We Can Do It!" poster on a United Press International wire service photograph taken of a young female war worker, widely but erroneously reported as being a photo of Michigan war worker Geraldine Hoff (later Doyle.) More recent evidence indicates that the formerly mis-identified photo is actually of war worker Naomi Parker (later Fraley) taken at Alameda Naval Air Station in California. The "We Can Do It!" poster was displayed only to Westinghouse employees in the Midwest during a two-week period in February 1943, then it disappeared for nearly four decades. 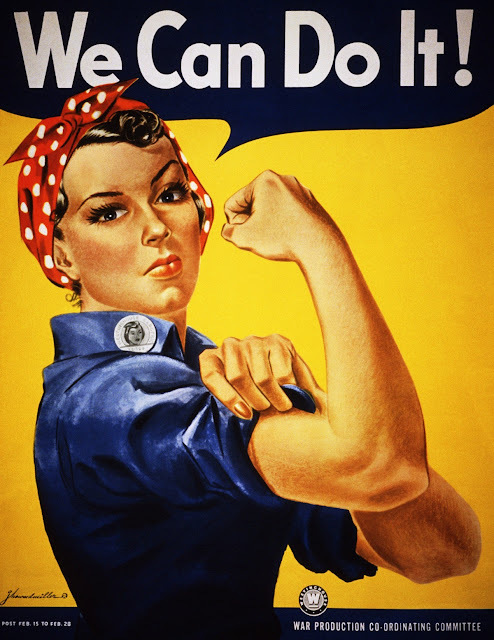 During the war, the name "Rosie" was not associated with the image, and the purpose of the poster was not to recruit women workers but rather as motivational propaganda aimed at workers of both sexes already employed at Westinghouse. It was only later, in the early 1980s, that the Miller poster was rediscovered and became famous, associated with feminism, and often mistakenly called "Rosie the Riveter". In 1982, the "We Can Do It!" poster was reproduced in a magazine article, "Poster Art for Patriotism's Sake", a Washington Post Magazine article about posters in the collection of the National Archives. J. Howard Miller's "We Can Do It!" poster from 1943. In subsequent years, the poster was re-appropriated to promote feminism. Feminists saw in the image an embodiment of female empowerment. The "We" was understood to mean "We Women", uniting all women in a sisterhood fighting against gender inequality. This was very different from the poster's 1943 use to control employees and to discourage labor unrest. History professor Jeremiah Axelrod commented on the image's combination of femininity with the "masculine (almost macho) composition and body language." Smithsonian magazine put the image on its cover in March 1994, to invite the viewer to read a featured article about wartime posters. The US Postal Service created a 33¢ stamp in February 1999 based on the image, with the added words "Women Support War Effort". A Westinghouse poster from 1943 was put on display at the National Museum of American History, part of the exhibit showing items from the 1930s and '40s. 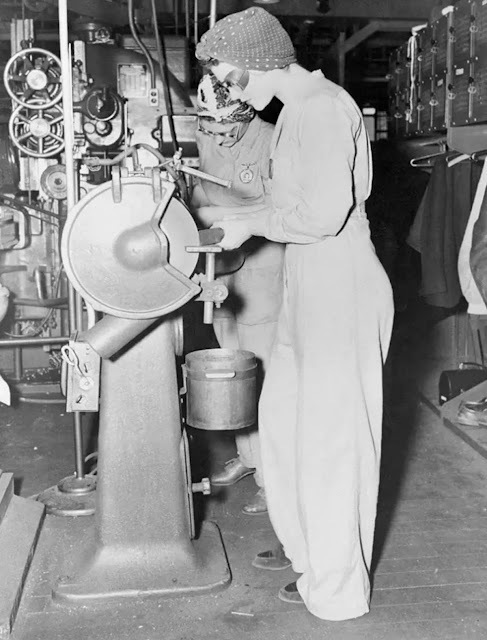 In 1984, former war worker Geraldine Hoff Doyle came across an article in Modern Maturity magazine which showed a wartime photograph of a young woman working at a lathe, and she assumed that the photograph was taken of her in mid-to-late 1942 when she was working briefly in a factory. Ten years later, Doyle saw the "We Can Do It!" poster on the front of the Smithsonian magazine and assumed the poster was an image of herself. Without intending to profit from the connection, Doyle decided that the 1942 wartime photograph had inspired Miller to create the poster, making Doyle herself the model for the poster. Subsequently, Doyle was widely credited as the inspiration for Miller's poster. 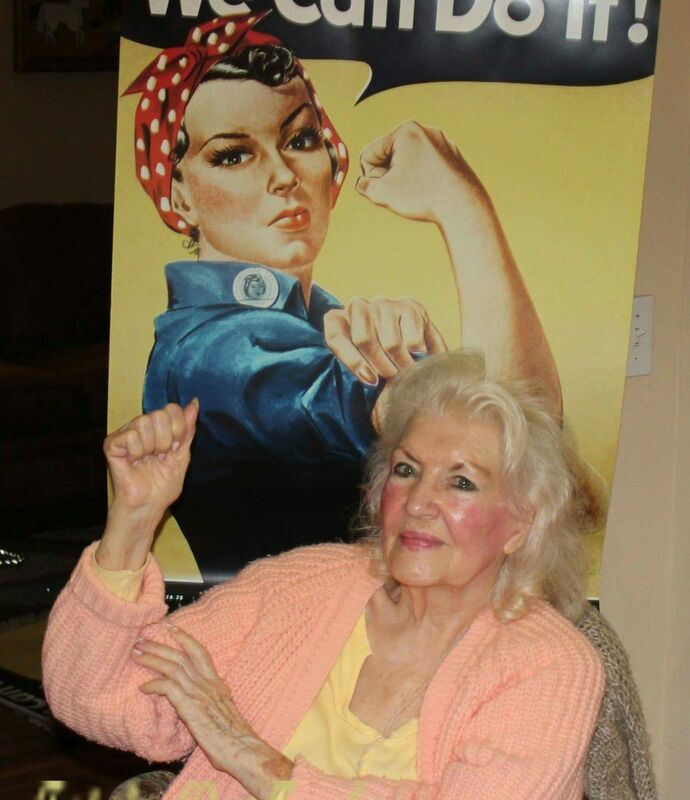 Geraldine Hoff Doyle (1924-2010), believed to be the model for the World War II era "We Can Do It!" poster, shown here in 1942 at age 17. From an archive of Acme news photographs, Professor James J. Kimble obtained the original photographic print, including its yellowed caption identifying the woman as Naomi Parker. 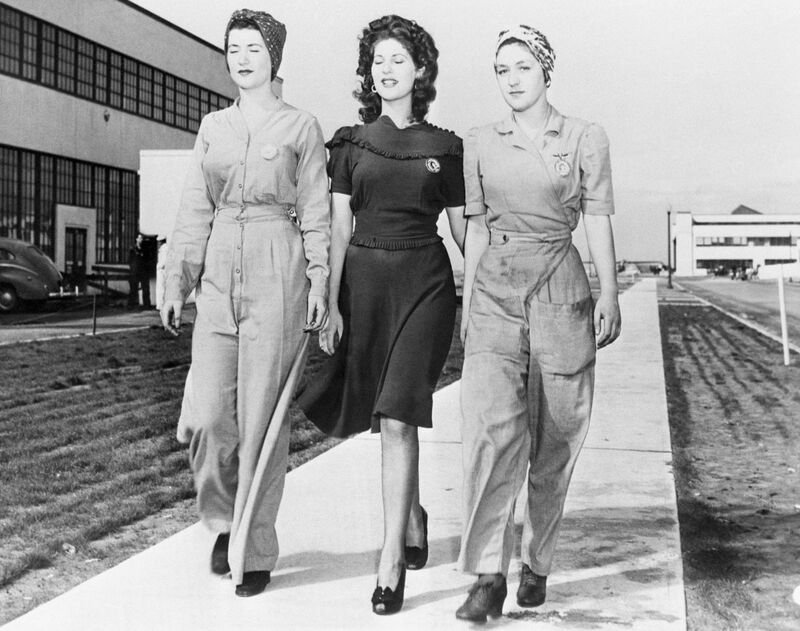 The photo is one of a series of photographs taken at Naval Air Station Alameda in California, showing Parker and her sister working at their war jobs during March 1942. These images were published in various newspapers and magazines beginning in April 1942, during a time when Doyle was still attending high school in Michigan. Fraley was unaware of her identity on the poster for 30 years until she was informed that her photo had been misidentified. “I couldn’t believe it because it was me in the photo, but there was somebody else’s name in the caption: Geraldine. I was amazed,” Fraley told PEOPLE in September 2016. However, it was too late to set the record straight as Hoff Doyle's identity was already cemented as Rosie. “I just wanted my own identity. I didn’t want fame or fortune, but I did want my own identity,” Fraley recalled. 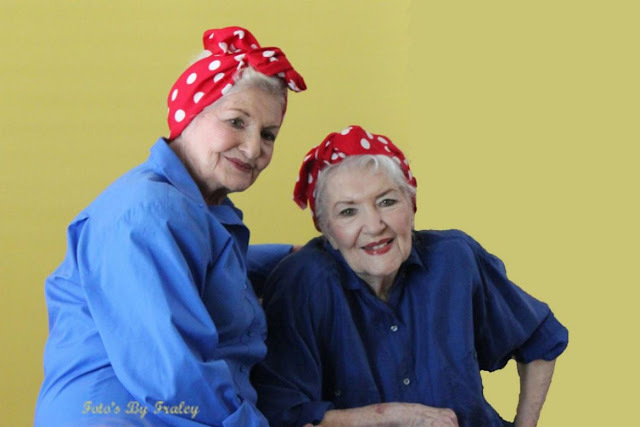 In February 2015, Kimble interviewed the Parker sisters, now named Naomi Fern Fraley, 93, and her sister Ada Wyn Morford, 91, and found that they had known for five years about the incorrect identification of the photo, and had been rebuffed in their attempt to correct the historical record. After the war, Parker worked as a waitress at the Doll House, a restaurant in Palm Springs. She was married three times. On January 20, 2018, Parker died in Longview, Washington at the age of 96. The following month, her life was celebrated on BBC Radio 4's obituary programme Last Word. Although many publications have repeated Doyle's unsupported assertion that the wartime photograph inspired Miller's poster, Westinghouse historian Charles A. Ruch, a Pittsburgh resident who had been friends with J. Howard Miller, said that Miller was not in the habit of working from photographs, but rather live models. 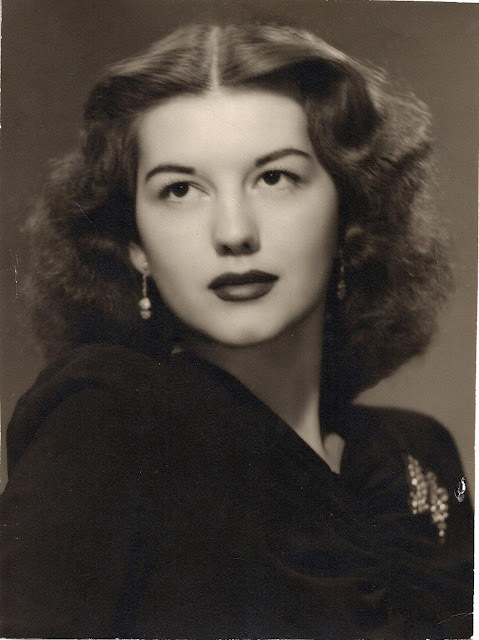 However, the photograph of Naomi Parker did appear in the Pittsburgh Press on July 5, 1942, making it possible that Miller saw it as he was creating the poster.